A successful project delivery based on building information modeling (BIM) methods is interdependent on an efficient collaboration. This relies mainly on the visualization of a BIM model, which can appear on different mediums. Visualization on mediums such as computer screens, lack some degrees of immersion which may prevent the full utilization of the model. Another problem with conventional collaboration methods such as BIM-Big room, is the need of physical presence of participants in a room. Virtual Reality as the most immersive medium for visualizing a model, has the promise to become a regular part of construction industry. The virtual presence of collaborators in a VR environment, eliminates the need of their physical presence. Simulation of on-site task can address a number of issues during construction, such as feasibility of operations. As consumer VR tools have recently been available in the market, little research has been done on their actual employment in architecture, engineering and construction (AEC) practices. This paper investigates the application of a VR based workflow in a real project. The authors collaborated with a software company to evaluate some of their advanced VR software features, such as simulation of an on-site task. A case study of VR integrated collaboration workflow serves as an example of how firms can overcome the challenge of benefiting this new technology. A group of AEC professionals involved in a project were invited to take part in the experiment, utilizing their actual project BIM models. The results of the feedbacks from the experiment confirmed the supposed benefits of a VR collaboration method. Although the participants of the study were from a wide range of disciplines, they could find benefits of the technology in their practice. It also resulted that an experimental method of clash detection via simulation, could actually be practical. The simulation of on-site tasks and perception of architectural spaces in a 1:1 scale are assets unique to VR application in AEC practices. Nevertheless, the study shows the investment in new hardware and software, and resistant against adoption of new technologies are main obstacles of its wide adoption. Further works in computer industry is required to make these technologies more affordable. 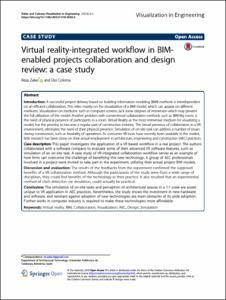 Zaker, R., Coloma, E. Virtual reality-integrated workflow in BIM-enabled projects collaboration and design review: a case study. "Visualization in Engineering", 1 Desembre 2018, vol. 6, núm. 1, p. art.4-1-art.4-15.